A social media message containing "racist references" posted by Russian club Spartak Moscow "shows a shocking level of ignorance", says the chief of anti-discriminatory body Fare. 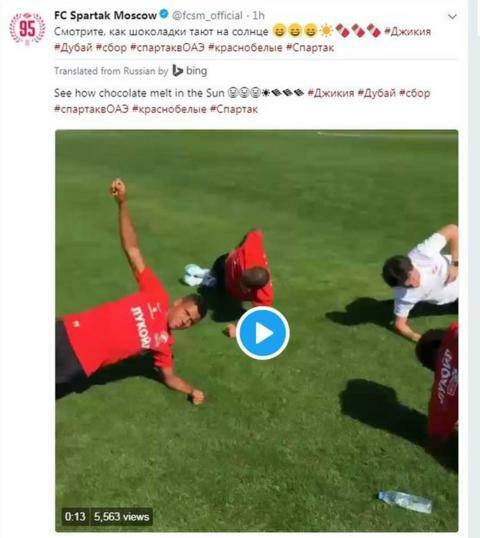 Spartak tweeted a video of some black players training in sunny conditions with a message translating as "see how the chocolates melt in the sun". "Racism is one of the biggest issues Russia faces in the year they host the World Cup. References like this show how some minorities are seen by some in the country," said Piara Powar. "For Russia's biggest club to tolerate and then celebrate racist references of this kind is wrong. "They were sanctioned for Islamophobic chanting recently but clearly the message has not reached the players or the club management." BBC Sport has requested a response from Spartak Moscow. Anti-discriminatory body Kick It Out added: "This social media post from the official account of Spartak Moscow only continues to highlight the prejudices towards black people in Russia. "With the World Cup only a few months away, it is a reminder that Russia - as with the whole of football - has significant work to do to eradicate racism of all forms from the game." In September, Liverpool's Nigeria-born attacker Bobby Adekanye was subjected to racist chants and gestures from Spartak supporters in Moscow during a Uefa Youth League game. Spartak defender Leonid Mironov has also been charged with racially abusing Liverpool striker Rhian Brewster. The alleged incident took place during a Uefa Youth League game at Prenton Park, which Liverpool won 2-0 in December. Uefa said the case will be dealt with by its Control, Ethics and Disciplinary Body, with a date for the hearing yet to be confirmed.